It’s been a while, but I’m still here. Or actually I’m back. Thanks for your patience while I’ve been on a three-month RV adventure through the Southwest. During the past three months we’ve spent time in Tuscon, Phoenix, San Diego, Palm Springs, Big Sur, Sonoma County, Napa Valley, Grand Canyon and so many other places. Throughout the trip I’ve looked at varied soils and wondered what might grow in them. I’ve had a Native American guide show me wild medicinal plants. I’ve admired rosemary and lavender in landscaping. I lucked into the date harvest and orange blossom seasons. Mostly I’ve just enjoyed all things garden-related. While I didn’t find opportunities to research or write about herbs during the trip, I am developing travel stories for a local newspaper. If you’re interested you can find the first of them Tombstone Preserves 1880s Mining Town. I’m working on at least six more stories. You will find them published, eventually, at Paris Wolfe on Travel + Food. Stay tuned to this Word Press Channel as more blog posts are coming your way. I seek herbs when I travel, to see how they’re part of a local culture. The Jean-Talon Market in Montreal was a jackpot. My favorite store in the historic market was Epices de Cru, a colorful exotic vendor of herbs, tea and spices. The husband and wife owners travel the world to bring home the best ingredients from the “ordinary” to the unusual. Think: Cinnamon leaf or avocado leaf (use like bay leaf with a different accent.) I was so entranced I visited twice. The second time I spent an hour perusing shelves and deciding just what to carry to my Ohio home. Feeling adventurous I asked for the most unusual product and was introduced to sansho pepper. I can’t decide if the person assisting liked me or hated me when I was allowed to sample the small “peppercorn” which comes from the berry of a deciduous shrub – prickly ash — cultivated in Asia. It was like my first experience with wasabi. Intense nerve confusion. I wasn’t sure if I was going to live or die. I lived. Obviously. First, the tip of my tongue numbed. That electrified numbness spread. From cheek to cheek I sensed a citrus – lemon/lime, maybe – coolness. And, my mouth started to water. It wasn’t hot or spicy, but like something had a hold of the nerves in my mouth. It expanded beyond taste to a physical sensation. And, it lasted nearly 10 minutes. Once I realized that anesthesia was the expected experience and the limit (I wasn’t succumbing to rare nerve poison), I was fascinated. But, why would someone want to add this seasoning to their food? Rumor has it that it cuts through fatty eel richness and minimizes heat perception in some dishes. I can see why. I didn’t buy sansho because I wasn’t sure my friends were ready for the challenge. But, you can find it at Spice Trekkers. The unusual herbs and spices are just part of the utility and charm of Epices de Cru. It’s also educational. I plan to compare rosemary from Provence and India as well as Oregano from Oaxaca, Yucatan and Turkey. I know origin has influence. When Martine and Edgar Anderson retired five years ago, they moved to remote Washington Island in Door County, Wisconsin and started their second careers as lavender farmers. On the north edge of the “lavender belt,” Washington Island is in growing zone 5B. Martine was following a childhood inspiration; she grew up in the South of France where lavender farms were a part of life. The versatile, aromatic herb romanced her and never left. The growing parameters on the Wisconsin island measured up. So Fragrant Isle Lavender Farm, Shop and Bistro is a 21-acre farm with 14,000 plants – 10 varieties — growing on five acres of land. Plans call to more than double cultivation in the next five years. “We’ve been here four years and the plants are growing very well,” Edgar notes. With supply, they needed demand. And, that hasn’t been a problem either. “The lavender industry in North America is small, compared to Europe and New Zealand. It took a big jump in the United States starting in the 1990s,” he says. And, he sees a need for U.S. growers to meet mounting demand. The top lavender producing country is Bulgaria with 150 tons in 2015, according to Ukraine Today and other sources. That’s followed by France, New Zealand, Ukraine, Russia, Australia and the Mediterranean region. Martine laments that U.S. lavender oil and lavender-scented products often come from China, where quality control is lax and purity may be questionable. “That’s not what you want to buy. We use pure oils, undiluted oils,” she says. Though all lavenders are edible, Fragrant Isle grows different varieties for aromatic and culinary uses. Martine notes the strong aromatics (some camphor-like scents) are off putting for culinary uses. In addition to the farm, Fragrant Isle has a café that serves lunch and has dinner hours on weekends. The 2,000-square-foot shop sells more than 150 products including body lotions, soap, body wash, linen spray, insect repellent, after shave and more. All use lavender from the farm. “We are constantly looking for commercial ways to use lavender,” says Martine. Diners at Le Petit Bistro experience culinary use they may want to repeat at home. “We use it in teas, in baking. We use it on fish, tenderloin, beef. We do sugar infused with lavender. We make jam,” says Martine. A recent menu item was Lemon Glazed Cake with Lavender Rhubarb Puree and Whipped Cream. While Martine and Edgar are quick to share their knowledge, they’re making it more fun with a Lavender Festival on July 22, 23 and 24, 2016. Timed for the flowering season, they’ll offer lessons in lavender chocolate-making and lavender wand-making. Music is scheduled throughout the festival and visitors double their stress relief with massages in the field. More than 5,000 guests are expected to visit the three-day event. For details on getting to the island and more, check out their website. Time began in a garden. Two weeks ago, I was in Fredericksburg, Texas, on a business trip for travel-writers. We stayed at the Fredericksburg Herb Farm where we enjoyed herbs and inspiration. Nestled among greens, tastefully scattered throughout the gardens, is a collection of cast cement blocks and rocks blooming with quotes. Like the lodging, spa and gardens, the sayings are restorative. They were the bonus I needed to power me through 13-hour days touring, meeting and dining with strangers. I was one of four members in our group who stayed in a replica Sunday cottage at the Farm. Sunday cottages are a historic notion; in the late 1800s German farmers built these simple structures for weekend visits to town for church services and supplies. While few original cottages remain, the town is dotted with replicas where tourists stay. My Sunday cottage was a modern, one-bedroom affair with a spacious bathroom. The delightful front porch was furnished with two rocking chairs, a wooden swing and a rosemary shrub growing in a knee-high terracotta pot. As expected, the herb theme was woven throughout the property. The bedroom had tasteful touches of herb décor, while the bathroom boasted hand-crafted body products made on site. These included invigorating peppermint shampoo, conditioner and body wash as well as gentle chamomile face soap. When I awoke my first morning, Basil-the-Cat greeted me on the front porch. A cat lady, I attract them wherever I go. Visitors may encounter three more cats – Yarrow, Milky and Pepper. Amenities on the four-acre property include a modern spa, farm-to-table restaurant, charming gift shop and manicured garden with more than 40 herbs, vegetables and native plants. Oh, and the omnipresent inspiring quotes. are a delicious-smelling reminder of summer. Herbs grown on site are used in the restaurant. Perhaps one of the more creative concoctions is a refreshing lavender limeade made with St. Germain’s elderberry flower liqueur, gin and Collins mix muddled with fresh lavender and splashed with soda. If you make it to Fredericksburg, don’t miss the 200-acre Wildseed Farms just seven miles east of town. The company plants, harvests and sells seed of more than 100 species of wildflowers, herbs and garden variety flowers. The cool part is that you can visit the Farm and see the flower fields in full color. Four speakers highlight the agenda for the The Herb Society of America Annual Meeting on April 29, 2016, in Asheville, North Carolina. Members recently received a reminder postcard. Registration begins FEBRUARY 9th. Follow the above link AFTER that day to sign up. Poland — Where the buffalo roam? I love all herbs. In my mind’s garden, I picture them in little compartments, just like in a real herb patch. 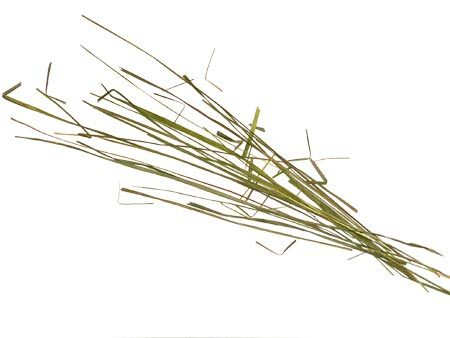 Another Polish herb we learned about is sweet vernalgrass (Hierochloe odorata or Anthoxanthum nitens) also known as vanilla grass or buffalo grass, which the Poles add to vodka. They call the plant trawa Zubrowka. 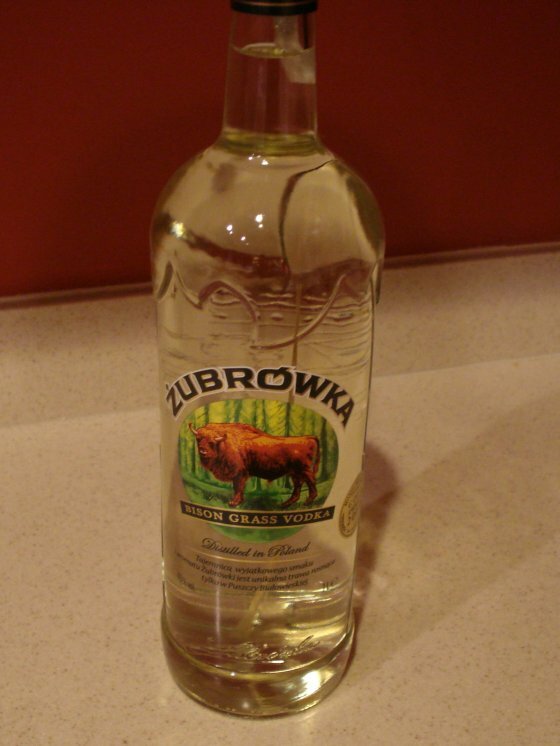 To prepare your own Zubrowka vodka, insert one or two blades of grass and a tablespoon of white sugar into a bottle of vodka. Shake the bottle, and then store it in a warm place for three to six weeks. The vodka is ready when it turns a soft yellow/green color. On both of our trips to Poland, we spent some time in the beautiful primeval forest of Bialowieza in Eastern Poland where Zubrowka grass grows. Bialowieza is famous for the 300 rare European bison that roam the forest. The bison love to eat the grass! Ted and I took a memorable tour of the forest in a horse-drawn wagon and also enjoyed several wonderful walks on our own. One afternoon, we rented bikes and rode through the little town of mostly wooden homes. Every home had a lovely garden in place of the customary lawn. It was hard to decide what to photograph! We pondered what causes such a beautiful tradition to develop. We cannot imagine returning to Poland without another visit to this wonderful spot. If you are in the Mid-Atlantic area, please join Lorraine Kiefer and other HSA members at their annual Herb Weekend, May 25 and 26, at Triple Oaks Nursery & Herb Garden, Franklinville, N.J. Visit the website to sign up for Lorraine’s e-mail newsletter and to receive a schedule of this herbal event. Most years Triple Oaks Nursery and Herb Garden carries sweet vernalgrass in their New Jersey garden center. You also can find sources for it online. To learn more about the bison of the Bialowieza Forest, watch this CNN video “Eye on Poland” on YouTube. Because I work in the ego-crushing atmosphere of a high volume sales office, I find the need for an occasional morale booster. So when my husband asked me to accompany him on a business trip to the Berkshire Mountains of Massachusetts, I felt compelled to say “Yes.” Normally, I am more likely to offer a quick “No,” but I saw this trip as an opportunity for a much-needed break and a chance to tour the gardens of the area. One of my garden stops included Project Native, which sells indigenous plants that grew in the region prior to the arrival of European settlers. This sounds like a noble initiative, but the truth is I primarily found the common goldenrod, pokeweed, and sumac that I tend to take for granted. Closer inspection, though, yielded some more interesting discoveries like purple angelica, Jack in the pulpit, wild orchids, and Sambucus Canadensis (American Elderberry), a plant I have been on the hunt for since discovering its tremendous dyeing properties. Next stop was the Berkshire Botanical Garden in Stockbridge Massachusetts. The public display gardens offered a colorful array of lush greens, purples, maroons, and the brilliant orange hues of autumn. The succulent-covered roof garden was fun and the themed herb gardens including: fragrance, cooking, and Hogwarts, were inspirational. 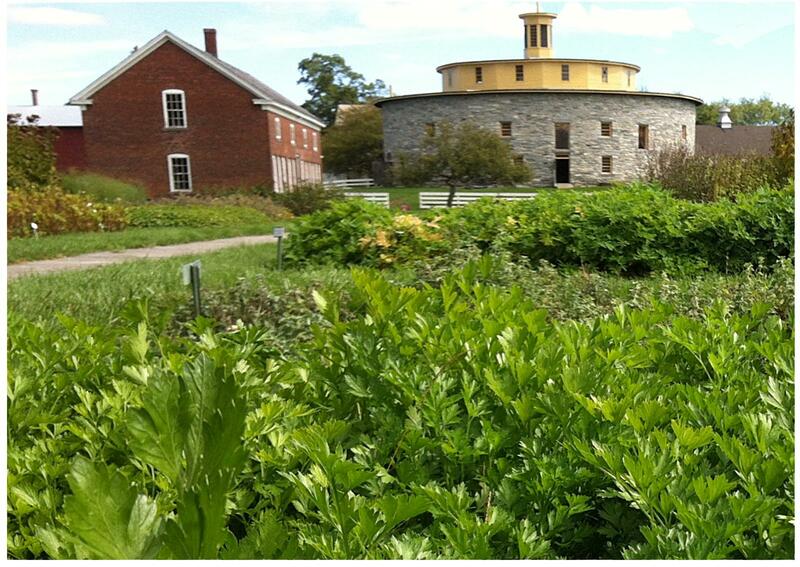 My last garden visit was to the Hancock Shaker Village, which is, perhaps, the antithesis of Project Native. 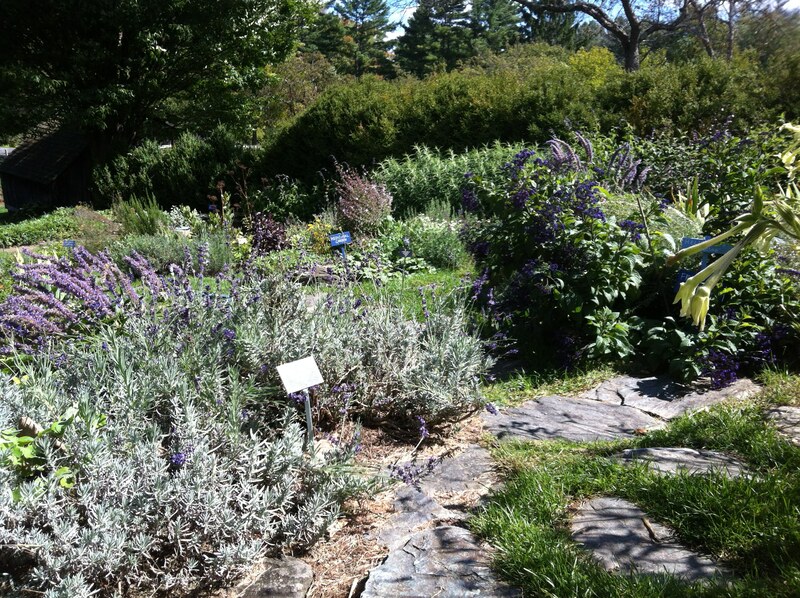 The herb and vegetable gardens were expansive and the sheer variety of herbs was overwhelming. Each plant was labeled with a simple marker referencing the common name, scientific name, and a brief explanation of its use. The grounds provided a clear vision of how critically important herbs were to the Shaker community. While away on my gardening stint, I received a request from my local Herb Society unit to create a NorthEast Seacoast unit page on Facebook. Again, I was compelled to say “Yes,” followed by a silent . . . “Yikes!” But how fortunate to be in the midst of the amazing Berkshires’ gardens which offer inspiration, not only for my own garden, but for our new Facebook page. Upon arriving home from our trip, I found, tucked in my front door, a request to have my garden added to our town’s 2013 Pocket Garden Tour. Saying “No” would have been the smart thing to do. But why say “No” when “Yes” leaves you open to more gardening possibilities and exploration.